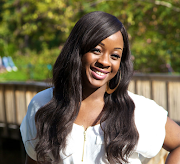 G I Z D O D O | Video Recipe | Ivonne Ajayi. 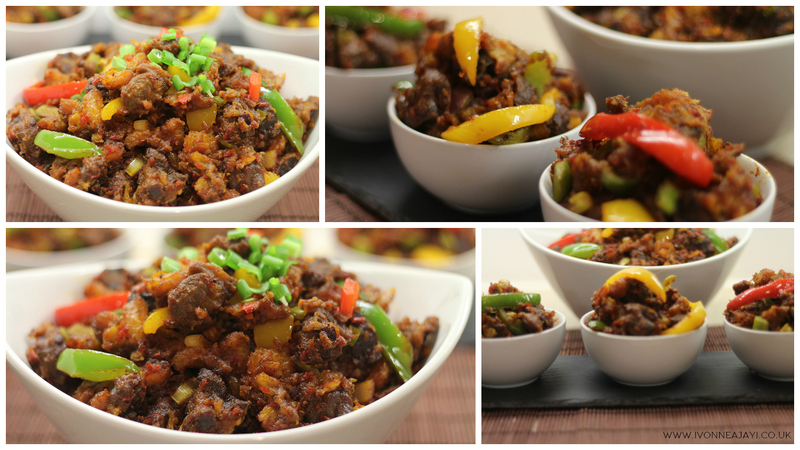 ‘Gizdodo’ or ‘DodoGizzard’, whichever you might call it, there is no denying that this dish is so delicious and a real crowd pleaser. Gizdodo as I like to say, is basically a fusion of chicken gizzards and plantain (also known as dodo) stewed in a peppered sauce. In this post I will share with you my recipe for the yummiest Gizdodo. 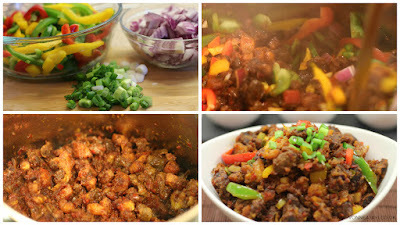 There are 4 main parts or steps to making gizdodo. Firstly you’ll need to prepare the gizzards. Secondly it’s the plantains. Then the third step would be to make the spicy pepper sauce. And then finally, you’ll need to combine the gizzards, plantain, and pepper sauce all together. Place the gizzards into a pot and with the hob on medium to high heat, add in 1 chopped onion, and 2 cloves of garlic. 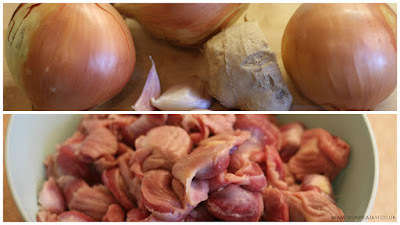 Adding garlic will not give the gizzards and unpleasant ‘garlicky’ taste, I am adding garlic as it is a good trick to remove the unpleasant scent of offals (you can also do this when cooking shaki/tripe). Next season the gizzards with the following: Knorr chicken stock cubes, a tablespoon of all-purpose seasoning, tablespoon of curry powder, tablespoon of thyme, tablespoon of dry pepper or cayenne pepper, teaspoon of black pepper, and a teaspoon of salt. Mix in all the seasoning and spices, ensuring the gizzards are well coated. Contrary to the norm, do not add water to the gizzards just yet. In doing so, it will ensure that all of the seasonings and spices added will penetrate the gizzards first. So you want to sear the gizzards on high heat with no water for about 5 minutes. After 5 minutes you will see see that the gizzards have plumped up a bit and have cooked in their own juices for a while. 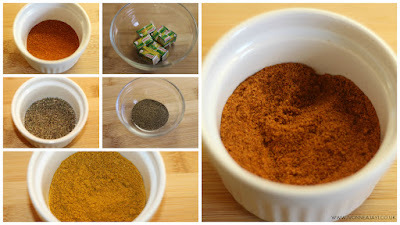 They will have also taken up the colours of all the spices added. NOW you can add water, make sure it is hot water (boiled). Ensure you add enough water to cover the gizzards. Leave this to boil away until all the water has dried up. Yes your gizzards will be ready only once all the water you’ve added has dried up – this might sound long, but it really makes a difference in the outcome of you gizdodo. Trust me. If you check on the gizzards after about 25 minutes you will see that almost 50% of the water originally added has been taken up by the gizzards and the stock is now slightly thicker, however it is still not ready. Now after approximately 40 minutes the gizzards should be done. You will know it’s done when all the water added has been completely dried up. Next cut up the cooked gizzards into bite size pieces. But make sure they’re not too small as they will shrink slightly during frying. Now it’s time to fry the cooked gizzards, so add enough oil to deep fry the gizzards (please note that you will also be frying the plantains in the same oil). Some people like to fry the plantains first so it sweetens the oil and then the gizzards, but I find that in doing so the plantains would have dried up and won’t be as moist when it’s time to add them to the peppered sauce. So fry the gizzards on medium to high heat. After 7-10 minutes frying, the gizzards should be ready. They should be perfectly browned, however not too dry and not too crispy unless you will have chewy gizzards that are too hard to eat. Next cut up the ripe plantain, for gizdodo you will need to cut the plantain into quarters. As stated earlier, fry the plantains is the same oil as the gizzards. 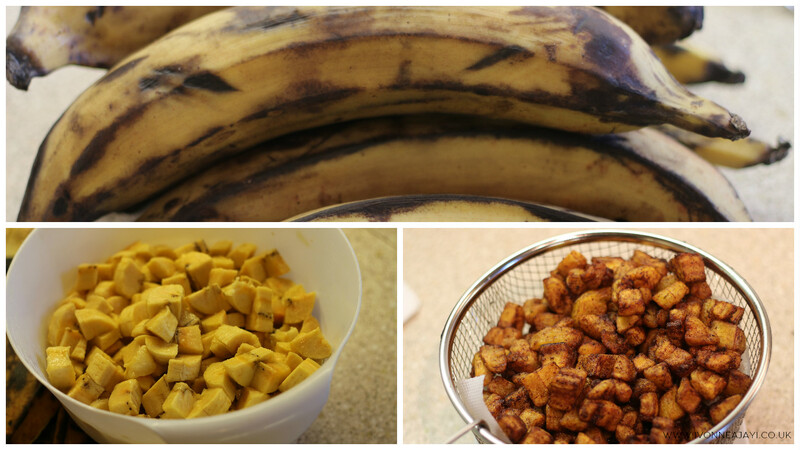 Using the same oil gives the plantains a delicious sweet and savoury flavour. Leave the plantains to fry, this should take roughly 10 minutes and remove once plantains have fried to a lovely golden yellow brown colour. To a blender or food processor add in 6 red bell peppers, 3 scotch bonnet peppers, 2 cloves of garlic and 2 yellow onions. I don’t use any tomatoes for this recipe, as it makes a huge difference using only red bell peppers. Also add in the ginger to the blender. You will need to grate the ginger into the blender because you don’t want a smooth blended pepper mixture (like regular soup), want you want is for the pepper mixture to end up rough and coarse, so you need to grate it so you can ensure the pieces of ginger are as small as possible as you don’t want to be biting ginger pieces. Next add water into your blender jug. Now as aforementioned, you want the pepper mixture to be rough in texture, therefore use the pulse function on your blender and pause at intervals to make sure that you don’t over blend. Do this until there a no large pieces of peppers or onions visible, but don’t let the mixture be smooth! What you should aim for is for the pepper mixture to be rough and course and mimic a finely chopped-up texture. Next it’s time to fry the pepper sauce, begin by adding palm oil and vegetable oil to a pot or a pan. While the oil is heating up slice up half of a red onion. Once the oil is hot enough add in the sliced onions and begin to fry. Continue frying till onions soften slightly. Add in the ground crayfish (a cooking spoon amount/2 tablespoons) – this makes a huge difference to the irresistible flavour of this dish. Continue frying the onions and crayfish till the bubbles reduce - the smell in your kitchen now will be one of a kind. 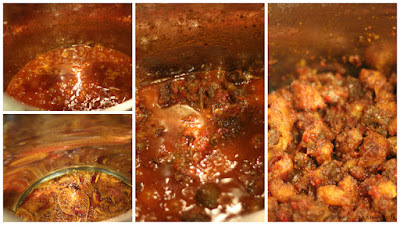 Once the bubbles reduce add in the blended pepper mixture and mix well till the palm oil and peppers are well incorporated. Ensure your hob is on medium to high heat so that the sauce fries instead of boiling. After about 10 minutes add in your seasonings, for this sauce I used Knorr chicken stock cubes, salt, and all-purpose seasoning, make sure you stir well - (uncover your pot). After a further 15-20 minutes with the pot uncovered and the hob on high heat, most of the liquid should have evaporated, leaving you with a thicker darker red sauce that has a slight layer of oil on top/bubbling thorough. The sauce is now ready and you can add in the fried gizzards from earlier. Stir well to coat all the gizzards with the delicious peppered sauce. 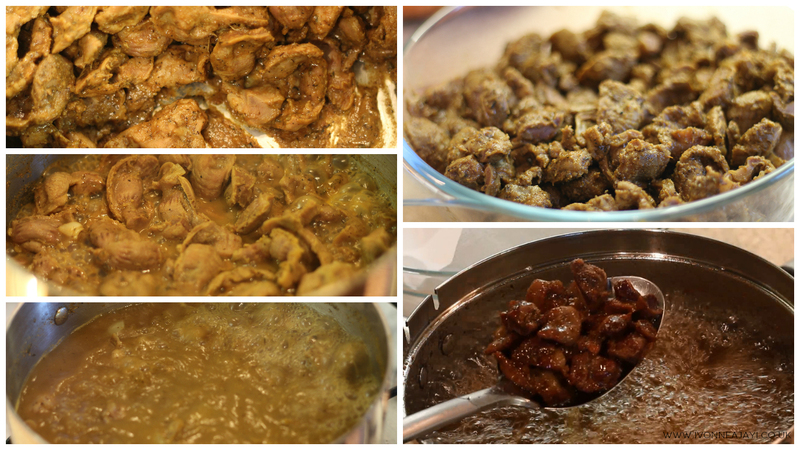 Lower the heat and leave the gizzards to cook in the sauce for 5-7 minutes for all of the flavours to merry together. Once this time is up, add in the fried plantains and stir all together – leave this to do its thing on medium heat for a further 5 minutes. While this is going on, slice up your red, yellow and green bell peppers. For added texture I cut some of the peppers in squares and some in slices. Also chop up 1 red onion, and 2 spring onions. Adding peppers, onions and spring onions to gizdodo gives it that added bite and freshness which compliments dish so well. After the 5 minutes is up you will see that the gizzards, plantains and the peppered sauce has really infused with one another and looks delicious. At this point you can add in the chopped onions and peppers and mix well. After 2 minutes I add in the chopped spring onions. And after a further 2 to 3 minutes on the heat, your gizdodo is ready! The end result, delicious gizdodo…chicken gizzards and plantain, stewed in a peppered sauce. Pair with your favourite rice dish or you could eat it on its own, it really is that delicious. Just Made this and I have to Thank you I wish I could send you pictures that I took but I want to again say thank you for sharing your gift. Tried it and my Nigerian husband couldn't stop eating it. Thanks for sharing.